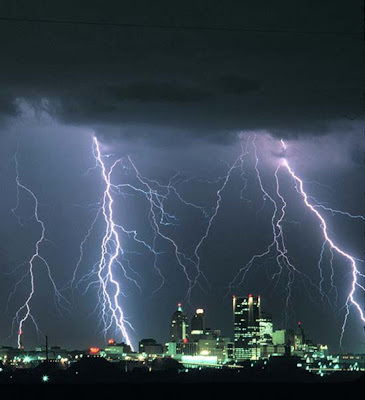 No, I did not take this photo...I don' know who did...I'm not even sure what city it is...I typed in the word "lightening" in bing (I binged it?) and this is one of them that showed up. It has been hot and humid this past week (oppressively so...especially when you work in a kitchen), and I have been hoping for rain. Well, when I was riding home this evening (sweating) with the Mundo loaded with groceries (see previous post) it began to thunder and lightening. It increased until it is constant. When I arrived home and was unloading the Mundo there was such a bright flash and then loud crash that it made me jump. I love when it thunders and lightnings (in the distance)...it really does make me realize how little I am in control of anything. As I type these words it it still pouring rain, and thundering and lightening....I think I'll shut off the computer, pour another glass of wine and sit on the front porch.